GOP Governors Hedge Bets On Health Insurance Exchanges : Shots - Health News Thirteen states are receiving $220 million in a new round of grants to help them set up health insurance marketplaces under the health overhaul law; nine of those states are headed by GOP governors. Seven of those governors are part of a multi-state lawsuit challenging the health law. Alabama Gov. 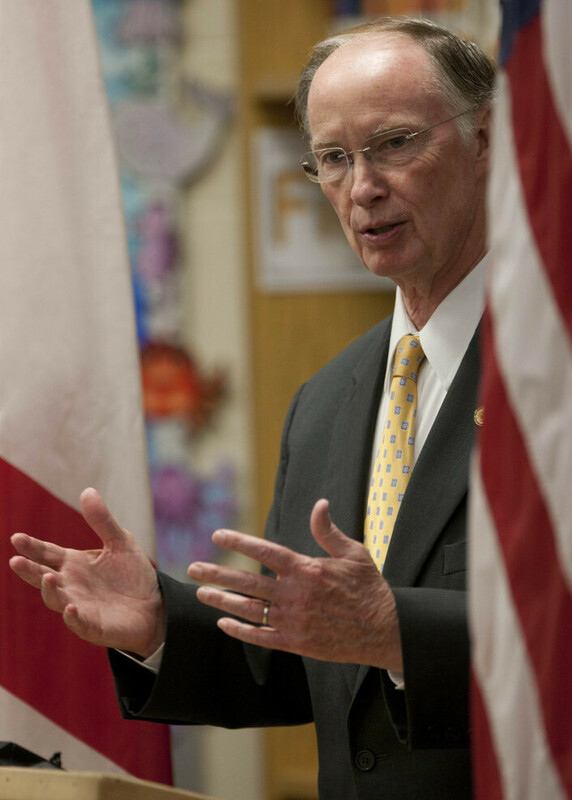 Robert Bentley is among several GOP governors accepting grant money to set up health insurance exchanges while also challenging the health overhaul law in court. Obama administration officials have announced another round of grants to states to help build the insurance marketplaces, called "exchanges," that will help individuals and small businesses buy health insurances beginning in 2014. But the real news is who's getting the $220 million. Nine of the 13 states in this round of grants are headed by GOP governors. Seven of those GOP governors are part of the multi-state lawsuit accepted earlier this month by the Supreme Court to test the constitutionality of a key element of President Obama's health overhaul law. The money for the grants derives from that law. Conservatives who want the entire law invalidated have cringed at state executives who are, in their eyes, undermining their opposition by accepting money to implement the measure. More likely, the GOP governors are simply being practical, because failing to set up an exchange won't stop it from happening. That's how Chiquita Brooks-LaSure, director of coverage policy for the Department of Health and Human Services, sees it. "They know that if they don't establish an exchange for 2014, then (the U.S. Department of Health and Human Services) will establish one in their state," Brooks-LaSure told reporters. For those of you keeping score, the seven states receiving grant money while also challenging the law in court are: Alabama, Arizona, Idaho, Iowa, Maine, Michigan and Nebraska. Alaska, Florida, Kansas and Oklahoma appear to be the only states that are refusing all federal funds associated with the 2010 law.